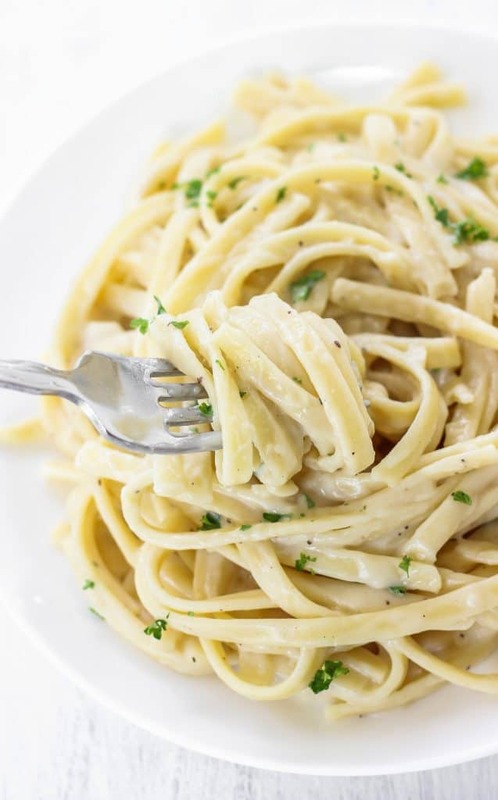 This healthy fettuccine alfredo is ultra creamy even though it contains no heavy cream or butter. Add grilled chicken or your favorite veggies for an easy & delicious meal! If you’re my 19-year old brother, you can add heavy cream to anything you eat. He’s been on a “bulk-up” plan for the past couple of years to accompany his weight lifting routine, so he’ll add a few glugs of heavy cream to his oatmeal…a scoop of ice cream to his smoothies…a slab of butter to his baked sweet potato. You get the idea. But if you’re like most other people, you’re probably not looking to add extra heavy cream into your diet. And that’s where this healthy fettuccine alfredo comes in. 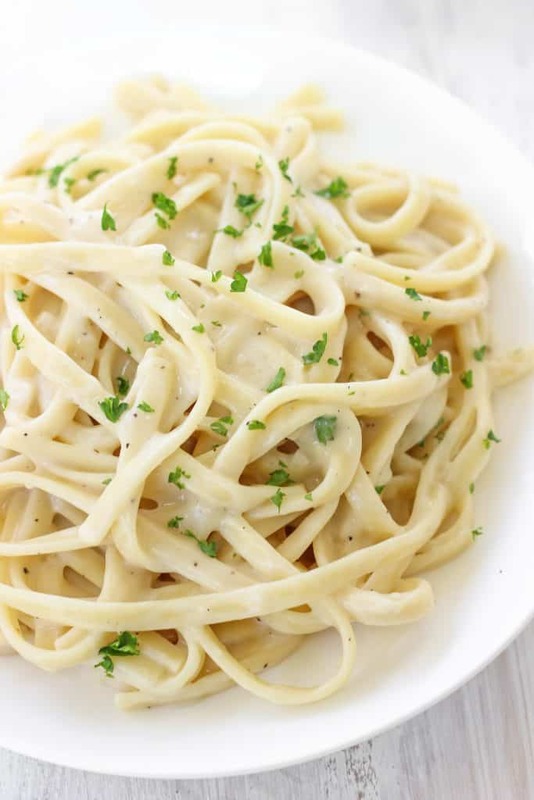 Made with just almond milk, flour, broth, a bit of olive oil, garlic, parmigiano reggiano (aka parmesan) cheese, and noodles, this healthy fettuccine alfredo is light enough to eat any day. Because who wants to save fettuccine alfredo just for special occasions? 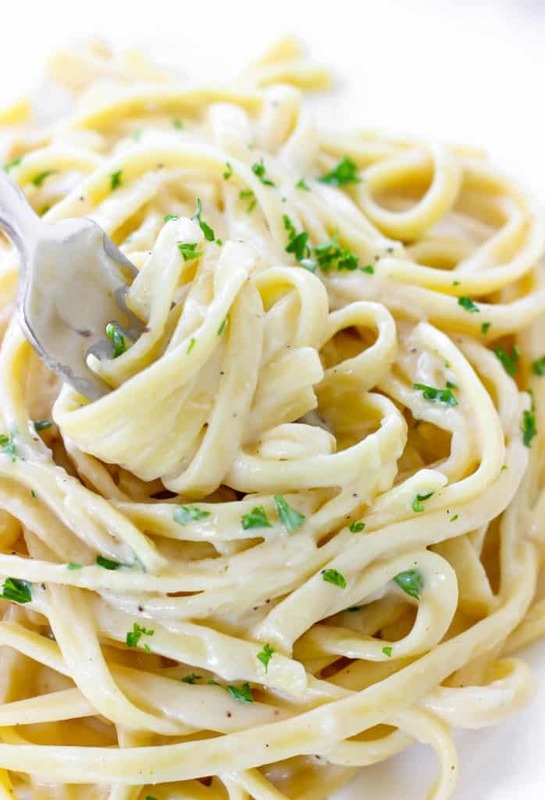 A bowl of this healthy fettuccine alfredo is a blank slate of creamy goodness. You can keep it simple and serve just the noodles, or you can add grilled chicken, caramelized onions, sauteéd mushrooms, or steamed broccoli. Fettuccine alfredo was one of the first pasta dishes I learned how to make and my original recipe was from one of those kids’ cooking schools, I think. All I remember is that it called for loads of cream, butter, and cheese. Over time, I’ve adapted the recipe to make it healthier and this pasta is one of my family’s favorite meals when I make it at home. Even my cream-loving brother loves it– I actually made it for him last weekend! It doesn’t include any healthy substitutes that’d make it taste just a bit “off” or tangy, like Greek yogurt. I included the family-size recipe since leftover fettuccine is awesome when heated up with a splash of milk since the sauce thickens up a bit as it cools. The leftovers also surprisingly freeze really well. And I can personally testify that this recipe is simple enough to make in a dorm kitchen. Need any more convincing? If you try out this healthy fettuccine alfredo,, feel free to let me know in a comment or take a picture and tag me @livbane on Instagram. Hope you enjoy! 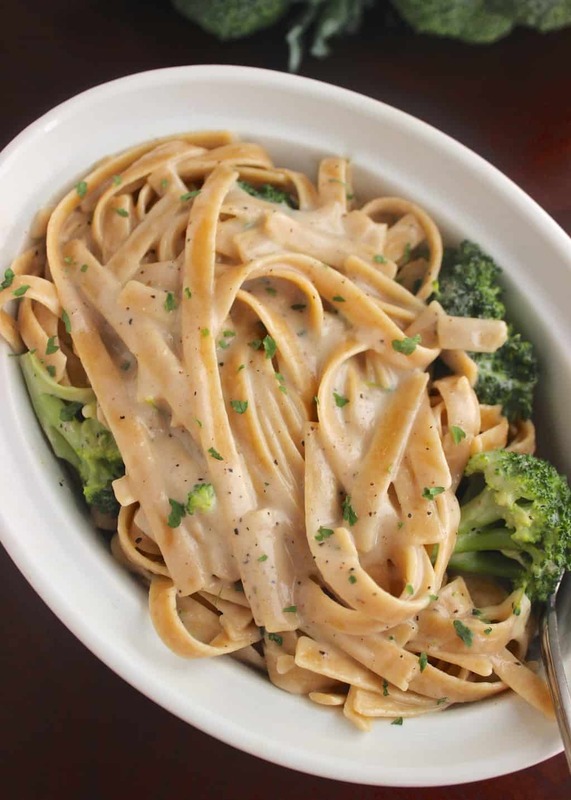 This healthy fettuccine alfredo is ultra creamy even though it contains no heavy cream or butter. Add grilled chicken or your favorite veggies for an easy & delicious meal! In a large pot, cook fettuccine to al dente according to package directions, stirring frequently since fettuccine tends to stick together. Drain into a colander. Return now-empty pot to the stove on medium low heat and drizzle in butter or oil. Sauté garlic for about 60 seconds, until fragrant. Sprinkle in flour and whisk for another 60 seconds. Add milk and broth and whisk until combined. Cook over medium-low heat, whisking frequently, for 6-7 minutes or until sauce is thickened. Add salt, black pepper, and nutmeg. Turn off heat. Add parmesan cheese and stir until cheese melts. Add noodles and serve immediately. If sauce become too thick, add a splash of milk to thin sauce. *For a vegetarian version, you can replace the chicken broth with more almond milk. Made with almond milk was a surprise. That is a great substitution for heavy cream. Combined with the other ingredients, it really is a close substitute! I can personally verify that this is delicious! It looks so creamy; it’s amazing that you can actually use almond milk for a lot of dairy based sauces, and it doesn’t taste any different. Almond milk in a traditional cream-based sauce is one of my favorite healthy substitutes! I bet that’d be delicious! This is a great idea – we love a good creamy alfredo but it doesn’t always love us. Going to give this a try! Oooh this looks SO creamy and delicious! And so easy too! This recipe looks great! 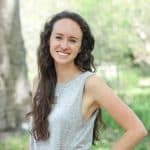 I too am a college student and am always looking for ways to “healthify some of my favorite dishes. I plan on making this soon! I see chicken broth on the ingredient list but I do not see where to add it in the recipe? Thanks for catching that, Sophie! You add the broth at the same time as the milk. Just updated the recipe. Hope you enjoy it!! Thank you! I will comment on how it turns out (although I am sure it will be great)! 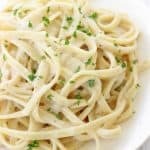 I have been looking for a healthy fettuccine Alfredo recipe for a while now and this one looks perfect. Oh I just love these amazing recipe, Liv! What a good idea for using low-sodium chicken broth. I’m definitely cook it for my family!! Have a wonderful day and thanks for recipe! Yummmmm!!…. a mess that starts with slurpy delicious noodles and ends with creamy fettuccine alfredo sauce. …i want to taste this dish yumm.. Does almond milk thicken better than nonfat milk? I’m curious to know what makes almond milk work? I use almond milk in this recipe because that’s the type of milk I always have on hand and I try to limit how much dairy I eat! You could definitely give dairy milk a try. The higher fat content of the dairy milk, the more it’ll thicken. Wow, gotta say I’m shocked how good this was. I made it to help my wife who’s counting points but I ended up liking it as much as the heavy cream version. Well done and thanks. We’ll be eating this again. I’m so glad you and your wife enjoyed this recipe!! Sauce didn’t seem to get thick enough. Was not impressed with the taste.